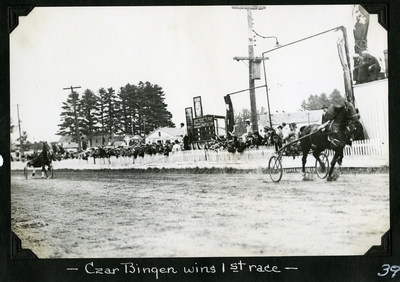 Black and white action photo of brown gelding, Czar Bingen winning a heat of the W. J. Wheeler & Co., Ins. 2.25 Trot, September 13, 1935 at the Oxford County Fair, South Paris, Maine. Chestnut gelding, Peter Azoff, seen in the backgroun, finished the race in second place.